For indoor or outdoor use with firm, level surfaces. Compact dimensions for space efficient storage. High angle steering provides excellent manoeuvrability. Variable speed motor extends battery life by using only the energy needed to do the work. Ergonomic joystick control operates from the platform or the ground. Extending platform increases usable working space. Power to platform - allows operator to use electrically powered work tools on the platform. Power source - 24V (four 6V Ah batteries) with automatic charger, 110 or 240v - please state requirement at time of order. N.B. 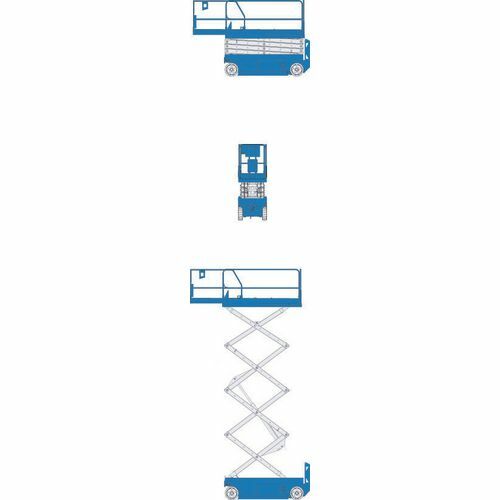 It is recommended that users of these lifts receive IPAF operator training - details and prices on request. For very high jobs like industrial or maintenance work you need a lift that is versatile and strong to enable you to concentrate on the task you are doing. 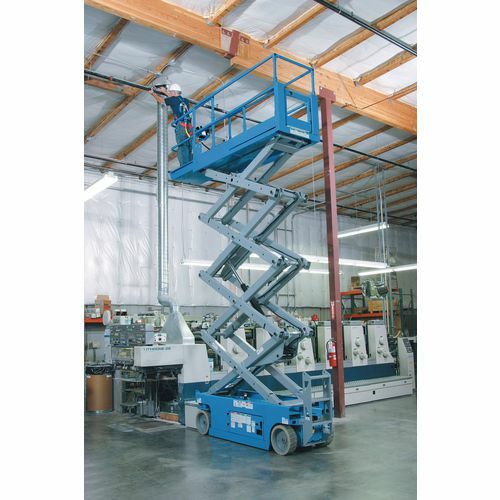 Our self-propelled scissor lifts come with an ergonomic joystick control that operates them from the platform or the ground; they are electrically power with 24V through four 6V Ah batteries and come with an automatic charger that charges on 110 or 240volt (Please state your requirement at the time of order). An excellent feature about this product is the extending platform that increases the usable working space which will make your working day more efficient. The variable speed motor extends the battery life by using only the energy needed to do the work, ensuring that this product will be reliable and has a long lifespan. High angle steering provides impeccable manoeuvrability and the whole unit has compact dimensions when not in use for space economical storage. We think this is a great product that will help you achieve the most out of your potential when working at height - a choice of two platform heights are available; 5790mm and 7920mm, they benefit from FREE UK Delivery and a 12 month guarantee.